This retreat offers an opportunity to reach more profound depths in the Silence of Quaker worship. The weekend is not a retreat inthe sense of turning away from life. It is a temporary intentional community where we seek communion with the Holy Spirit, the world around us, and each other. With God’s help, we may be led to new priorities and insight for ourlives. We may reach a deeper communionwith our authentic selves, our spiritual community, and with the Divine. The weekend begins with a potluck supper Friday evening at 6:30. Visiting helps us unwind and begin to know each other. After supper, housekeeping details arearranged, questions are discussed, and our schedule completed and explained. We will begin Meeting for Worship and enter the living Silence that will last until the rise of Meeting on Sunday noon, no matter what the activity. Cost should not be a barrier, but we need to average $100 per person to meet expenses. A link to the registration form is below. Please register by 1/21/2019 – see the form for details. Contact Heather Saunders at hstarathome @ gmail.com (take out the spaces) or 360-252-0548 for more information. AND, I highly recommend the extra day: it was wonderful, and the drive home was easy! The Hearthkeeper staff position for Olympia Friends Meeting has been filled. Thanks. At our last Meeting for Business, the Meeting agreed to create a new part-time staff position called Hearthkeeper. A four-page description of the position and how to apply is linked below as a PDF document. It is hoped to have the new Hearthkeeper begin work April 2nd. Initially, we are announcing this among f/Friends until March 11. Deadline for in-house applications: received by noon, Sunday March 10. After that time, depending upon the response, the position may be advertised more broadly. Olympia Friends Meeting is seeking a Children’s Program Support Specialist: a quarter-time (approximately) paid staff member to coordinate and support our programs for children and teens. We are hoping for a person who has experience with working with children/youth, has a background in the Quaker faith and/or religious education of a compatible faith, and a willingness to become knowledgeable and qualified to support and teach about Quaker traditions and values. The person in this position will assist our Children’s Committee in implementing our programs, by helping with curriculum, coordinating volunteers, obtaining supplies and helping support our events for children, youth and families. We would like this person to be ready to start in early July. Interested folks should read the job description carefully, then submit a resume and cover letter by June 19, 2017. We are hoping to interview in late June. in a measure far greater than our share. to worship the idols of hatred and contempt, hear our prayer. what holds us together in law and harmony. and who have made selfishness a virtue. Help us with your love. 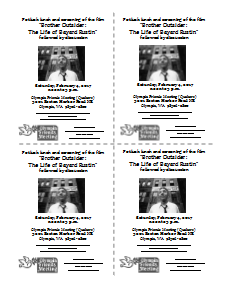 Saturday, February 4, 2017, noon to 3 p.m.
Bayard Rustin was raised by his Quaker grandmother. In high school he protested segregation at a hometown restaurant and was arrested for sitting in the whites only section of a theater. 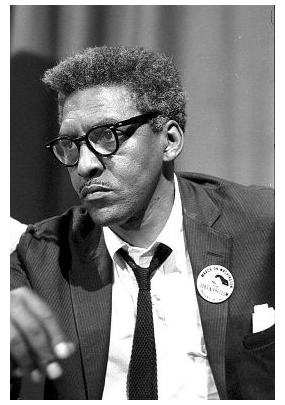 Rustin’s belief in nonviolent action as a means for social change gave him a guiding vision for the civil rights movement. He helped A. Philip Randolph plan a March on Washington in June, 1941. Abraham Muste, executive secretary of the Fellowship of Reconciliation, who had also been involved in planning that march, then appointed Rustin as FOR’s secretary for student and general affairs. Rustin met Martin Luther King Jr. in 1956 after traveling to Montgomery, Alabama, to assist with the boycott of the city’s segregated bus system, and is credited with helping to mold the younger King into an international symbol of nonviolence. 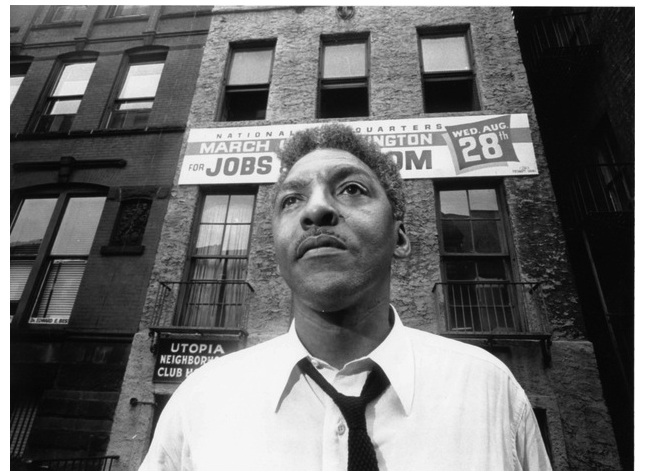 Bayard Rustin was the primary organizer of the 1963 March on Washington. Despite these achievements, Rustin was silenced, threatened and fired from leadership positions – sometimes because of his uncompromising political beliefs, but more often because he was an openly gay man in a fiercely homophobic era. BROTHER OUTSIDER reveals the price that Rustin paid for this openness, chronicling both the triumphs and setbacks of his remarkable 60-year career. 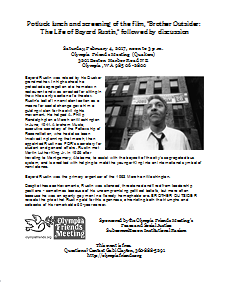 This free event was sponsored by the Oympia Friends (Quakers) Meeting’s Peace and Social Justice Subcommittee on Institutional Racism. Friends Committee on Washington (State) Public Policy* (FCWPP) is looking for a part-time Legislative Advocate and Policy Analyst (lobbyist) for the 2017 legislative session in Olympia. This position will require approximately 20 hours a week during session and 10 hours a month before and after session (starting November 1, 2016). Compensation is $20-30/hr., depending on experience. Deadline for resume and letter of interest – September 15, 2016. Download the full announcement with more details here in PDF format. The Olympia Friends Meeting’s Peace and Social Justice Committee has joined Steven Aldrich, OFM, Doug Mackey, Olympia Unitarian Universalist Congregation, and Kim Dobson, Fellowship of Reconciliation, to host Maiya Zwerling, the national field organizer for the Friends Committee on National Legislation (FCNL). Our shared effort is to support an FCNL project structured to help break the gridlock in Congress. 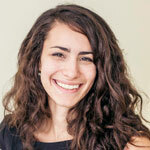 With Maiya’s assistance we are launching an FCNL Advocacy Team in Thurston County. You can help us coordinate with similar FCNL supported Teams across the country. Maiya is coming to Olympia on Wednesday, June 29th to tell us more at the Olympia Friends Meetinghouse, 3201 Boston Harbor Rd NE, from 6:00 pm to 9:00 pm. It’s no secret that Congress isn’t making enough progress on the issues that matter most. But the Quaker lobby that works through FCNL has an amazing track record of fostering Congressional champions for peace and justice — they take strategic steps every day to move Congress in the right direction. Please join us. RSVP with the form below to let us know you will attend. This event is sponsored/endorsed by the Peace & Social Justice Committee of Olympia Friends Meeting, the Canadian Friends Service Committee, and Independent Jewish Voices (IJV-Vancouver and IJV-Canada). For more information, contact: Jack Zeiger, (360) 943-0965.